Most people buy dry cell batteries for a specific device and then chuck them when they begin to fail. I’d like to suggest a little experimentation, using a multimeter. These devices are quite cheap nowadays and my digital version was about £6. 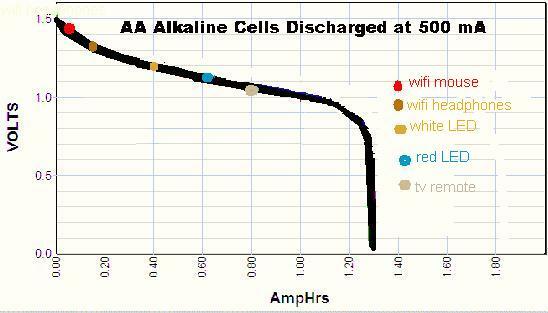 The graph shows how the voltage of these batteries drops with use. Basically the central carbon electrode gets blocked off by gases and effectively insulated. If this problem didn’t exist then the batteries would work at maximum voltage until all the Zinc casing was eaten away but it doesn’t. This is why they’re recyclable. This graph shows a typical voltage characteristic for a battery, although most can be 1.6 volts when new and some can last longer than the average. In my opinion the cost of the better ones is usually too high and it’s more efficient to buy two average ones. What I noticed was that my wifi mouse ate up batteries but the batteries still registered about 1.45 Volts on my multimeter. Placed in my wifi headphones they began to give problems whilst reading about 1.35 Volts. Transferred to my wife’s “candles” they worked well until about 1.2 Volts, when only the red LED was giving light. These would still work the remote controls for some considerable time until the Volts dropped to about 1.1 volts. These figures aren’t rigorously proven but merely serve to give an idea of how to minimise cost and waste. It’s worth checking out your own needs, if you’re as penny-pinching as me. It’s now an established political truth that the World is getting hotter and it is caused by the burning of fossil fuels. This is also persistently proclaimed, by climatologists, as a Scientifically proven truth. So far, the consequences have all been political I.e. conferences, debates and treaties. Industry has complied by switching from burning fossil fuels to building wind turbines and solar panels. All very laudable but to what purpose? The population of the planet is increasing geometrically and so is the amount of Carbon dioxide that we are producing, just by breathing. Assuming we can keep feeding everyone and there are no natural disasters, global warming will continue regardless. Is it not time that the politicians and climatologists turned their efforts to gaining some benefit from all the money spent on these conferences and accords? Instead of writing further learned treatises showing incontrovertible proof that Polar bears will become extinct, the ice caps will melt, sea levels rise and many major cities drowned. Instead of this, perhaps the experts could turn their attention to coping with their doom-saying. Perhaps, moving new building to higher ground, instead of constructing expensive stop-gaps like the Thames barrier. The alternative may lie in learning to live in our own sewage like Venice. Perhaps investigating how agriculture should adapt to new crops and fisheries to new food species. Perhaps we should stop crying over the polar bear. We won’t save it by signing bits of paper. If we must conserve the polar bear, it’ll have to be in zoo’s and cryonic chambers. letters to Daily Mirror. only one printed. I find it hard to believe that Tiverton Town Council lost two full years of Council Documents. The first thing that should be taught on computer security course is the grandfather, father storage system for files. Even a basic Windows domestic PC platform will recommend a monthly backup of your files. Computer memory is extremely cheap and fast nowadays; it should be a routine to save working files and archive others. To lose two years worth can only be construed as mismanagement, or an administrative convenience. What is the point of asking anyone on BBC’s Question Time, how they’d feel, if an elderly relative had had to wait 8 hours on a trolley in A&E? This is root cause of the disaffection between voters and politicians. We know that their elderly relatives would be snug and secure in a hospital bed, whilst most of ours were waiting for an ambulance. The same applies with many of the public services, which the majority rely on, such as education, social care, pensions, public transport and so on. Why has the BBC started asking “when” we should be charged to see a GP? The question should be what is the point of a GP, if you are going to charge to see them? It’s the GP who does the initial diagnosis and then re-directs to a specialist, as needed. It’s the GP, who judges, whether you should be allowed prescription medication. It shouldn’t an overworked random intern in A&E. Sound recordist Simon Clark is reported as putting the blame for poor sound quality on flat screen TV’s. As someone with poor hearing, I use radio headphones to listen to TV. More often the problem is “atmosphere”. Trying to distinguish what is being said in noisy offices, restaurants, dance halls is too realistic. It doesn’t happen in old Hollywood films, where the “atmosphere” is set as the stars walk into a noisy room, then once the dialogue starts, the “atmosphere” is tuned out. The same complaint applies to football matches, where the commentators might as well give up and go for a pie. With what’s happening to our NHS, it’s unbelievable, for me, that we are helpless to prevent it. There was no mention of this destruction in any pre-election speeches. In fact we were assured that the NHS was “safe” in Tory hands. In normal circumstances, one can understand the need for Governments to have the stability of a five year term of office but the Sovereignty of Parliament becomes a farce, when the wishes of the Population are ignored as an irrelevance, even in times of War. There needs to be a means for the population to demand a General Election, or, at least, a referendum on issues, which directly affect the whole population. #|t’s unbelievable what’s happening to our NHS and it has left me feeling helpless. There was no mention of plans to shut hospitals in any pre-election speeches. In fact, we were assured that the NHS was safe in Tory hands. There must be a means for people to demand a referendum on huge issues. Remind me why our Gas and Electricity were privatised. To turn us into a shareholder nation? But if working people had enough spare cash to keep shares, Wonga and Visa would be out of business. They were going to build new power stations etc., which is why some are still running decades after they were supposed to be closed down. It’s why the Government has agreed to pay an extortionate price for the French and Chinese to build a new nuclear power station. Prices would come down through greater efficiency. It’s all a nonsense, really. Instead of one overpaid CEO (like British Gas boss, Iain Conn), we have a dozen, each with a duplication of Accounts, Computer, Admin, PR, Sales and Advertising departments. We have a whole industry badgering us to Switch suppliers, wasting a few more hours of our lives. Who pays for them? complaints, delivered through badgered MP’s and Ministers. I even remember complaining about having to wait in for the gasman to bother to show up. Still some things never change. Why are some Labour MP’s joining the Tory chorus of attacking Jeremy Corbyn? It can’t just be the loss of Copeland, where the Labour vote has been dropping by thousands ever since the initial success of Blair’s Gov’t in ousting the “Sleaze” ridden Tory Gov’t. Blair was encouraged to quit in favour of Brown, because of his unpopularity. Brown lost the following election mainly because of his beggaring the Nation to bail out the banker’s but partly because of his “bigot” attack on a Labour supporter. I think the latter carried more impact for the ordinary voter. Miliband lost the next election and gave fuel to UKIP by further deriding Labour supporters and denying them the right to a referendum on the EU and by not challenging the Tory claim that Labour were not responsible with money. Two elections lost but Corbyn has yet to lose an election. Nevertheless, he has been subjected to so much abuse by MP’s of his own party, that Labour voters at the far Left and far Centrist have been given cause to withhold their vote. Whether, or not, Corbyn is replaced, Labour looks set to lose the next election, unless the whole of the Parliamentary Labour Party starts singing from the same song sheet and a tune that all sections of the Labour vote can endorse. Judging by recent comments, still being made by some MP’s, this will never happen. No doubt there will be plenty of suggestions as to who can replace Jeremy Corbyn but they will all be tainted by either Blairite or Corbynista attacks and will lose votes from one of those sections of voters. Reading the article on the Sunday Mirror Poll, it says nearly two-thirds of Labour voters are satisfied with Corbyn staying as leader. We need to grow on that and find out why the remaining voters aren’t happy. It also says that over 5 in 6 think Labour has the right policies. Presumably the remainder have some concern over particular issues. We obviously need to consider what these may be, bearing in mind that you can’t please all the people all the time. Perhaps further polls are needed but ones which seek to find what aspects of Tory policy concern their voters. I can’t believe that all of their voters are happy with their policies on the NHS, prisons, police, HS2, trains and schools. I was told that in order to sell their cars in the EU, Nissan had to agree to incorporate poorer but more expensive French components such as the nylon reeled electronic window winder (5 million imported parts per day). If Nissan remains in the UK and has surcharges imposed by the Single Market, then Nissan would presumably be able to manufacture their own, better quality, components here. They would be producing a superior product, more cheaply. It would be worth the Government’s while to try to keep Nissan here, if they cared about the Economy and UK jobs. Although I can’t endorse The Lords interference in the brexit process, their amendment has pointed up the lack of support for Theresa May’s intent to use the future of EU residents as a negotiation tactic. This total lack of support must surely have lost her any hoped for leverage in her negotiations. I would think that those, who do consider themselves as British, would formalise that status and apply for citizenship to avoid future problems. I understand the logic of the Law against “stealing by finding” but I have strong sympathy for the woman prosecuted for pocketing a stray £20 note. I have known a case where someone found a £20 note being blown along a beach. Someone, who found one folded up on the floor of a packed New Year’s Eve pub. To whom would you pass it? Legally, you take it to the police, you get a chitty and in 6 month’s time, if no-one has reported it lost, you are invited to claim it. Would you be able to take it into a cop shop and explain what you were doing? Would you be able to tell anyone that you had done this? What if it was a 10p coin? If you lost a £20 note would you report it to the Police, hoping to recover it? There’s legality and morality and there’s a fear of ridicule. I like the idea of futsal mentioned in the piece on Daniel Sturridge. It made me wonder if its use of a smaller ball explained the dominance of South Americans. The smaller size of the ball must mean a greater concentration on the ball, rather than the opponent. Paul Maguire’s assessment, of Scotland’s income, suggests that an independent Scotland would need to go asking for financial support. Seeing all those Tory grandee’s, who’d held Cabinet posts during the Tory Sleaze years, sitting in the House of Lords, for the Brexit debate, made it clear that the second Chamber needed an overhaul. My problem is that the House of Commons isn’t really that much better, with its own drones and money grabbing opportunists. Do we need a second chamber, if it’s only going to be a copy of the first? Either it will rubber stamp every bill, or worse, block every bill, regardless of its content. If we do have a second talking shop, then it has to be elected and it has to be devoid of party political alliance. Nobody, who has ever subscribed to, or donated to a political party should be eligible to hold office. This would probably exclude most of the older generation and create a Junior house, more representative of the Nation, from which politicians, who’d proved their worth, might be promoted to the House of Commons. When will terrorists realise that their actions achieve nothing positive. Hitler was reported to have acknowledged that the terror bombing of places like Bath and Coventry did nothing towards winning the war. The IRA bomb campaign did not achieve a United Ireland. Daesh murders will not bring about a Caliphate. Ordinary citizens can not affect any such changes. Their deaths and maimings, whilst being condemned by national leaders, will not affect the actions of Governments, any more than accidents such as floods or train crashes. The terrorists will not achieve fame, or admiration, or gratitude, from anyone, least of all those whom they believe they represent. Individually, they will be unmourned and forgotten by any but their own families. This is allegedly the most heavily observe country in The World, with innumerable CCTV camera’s spying on us. The number of Police monitoring them is limited by the persistent repeated cuts to funding of all public services. On the other hand, we have many isolated, often elderly, citizens with time on their hands. It would seem that this army of potential watchers could be useful in some way. For instance: in the case of low priority terrorist suspects, watchers could be assigned to simply take screen shots of visitors/contacts, with time stamps. A police officer could take a daily dip into the relevant files (perhaps with several watchers having contributed). Instead of having to observe suspects on a 24 hour basis, one officer could scan a hundred sites and then call up recorded video of particularly interesting clips. Those mentioned on the TV News were the low cost, possibly cosmetic and others, which most wouldn’t bother their GP over. Top of the list for savings is a medication for an underactive thyroid. This is a significant medication. I remember watching my Mum shambling down the street, pop-eyed, swollen-necked and looking twice her age. After diagnosis and treatment, she swiftly returned to a younger active working woman. This medication can’t be cheap for the individual if it costs £31 million, for the whole NHS. John Prescot usually presents a sound point of view on most issues but his comparison of the Iraq war with the Falklands shows a disconnect with how most voters viewed both. The Falklands War was about an invasion of British Territory and an attack on Brits. The Falklands might be separated from us by a couple of thousand miles of ocean but that’s an irrelevance. To most of us, it could just as easily been the Outer Hebrides, which it resembles. Maggie’s success, in protecting “us”, gave her an otherwise undeserved success in the following General Election. Iraq was seen as a murderous intervention in another nation’s affairs, at the bidding of the US President. The suspicion that it was about oil wealth didn’t help. In the context of Gibraltar, Howard’s main fault, apart from being Gung-Ho, was in thinking that Spain might do any more than wave a red flag at us. George Osborne, editor of the Evening Standard, formerly Chancellor of the Exchequer, presumably okayed the sale of some more Lloyds’ shares at £40 million less than we paid for them. We’re told that some were bought by Black Rock, who coincidentally hired him for his expert advice and contacts. Now it’s reported that the “entirely independent” head of the NHS is to ask the Treasury if he can borrow £10 Billion from Hedge Funds, presumably at a generous rate of interest. If the Treasury agrees, will it be the hedge fund that Mrs May’s Hubby works for? I’d be surprised, if not, but it’s no surprise that voters have contempt for politicians, who create the relevant laws and promulgate practices, which enable them to legitimately raid the National coffers, whilst protesting that their dealings are perfectly legal and above board. Mr. Cameron’s involvement in tax havens, his father-in-law’s wind farm subsidy, The Lords attendance fees, MP’s OTT expense claims, Jeremy Hunt’s £12million windfall, all the other perfectly legitimate tax-payer funded activities, such as privatising rail, education and NHS contracts can all be explained away and protests brushed off, as lacking merit. But the stench of corruption lingers outside Westminster, where they are so accustomed to the smell that they no longer notice it. Why do sites like Ticketmaster have to be so scammy? I had to book two ticket to Queen for my wife and daughter @ £69 each but by the time I had jumped through all the hoops and accepted all the add-ons, the final price was about £87 each. They know that customers of such events will accept the add-ons, so why not be up front and just charge a flat £90. They know it will be paid and instead of irritating fans, they could hand out free souvenirs to earn bouquets, instead of brickbats. The final £50 voucher for Hotels.com is just snide. I was pleased with the verdict in the candy-striped house case; more so with the the decision by the judge that the Council had misused their powers under the Town and country planning Act 1990. My understanding was that this sort of legislation was originally brought in to stop the creation of slums and shanty towns, ensuring that all housing was safe and fit to live in. It has, since, been extended to the protection of the character of “charming villages” and “industrial heritage” sites and now to any ordinary house with neighbours, who have friends on the Council. A cottage in Kennford, Devon was apparently the wrong shade of pink, another in Inverclyde was the wrong shade of cream. In both cases, Councils used their muscle to intimidate the owners. I’ve no doubt there have been numerous other similar cases of bullying. The candy stripe house was an extreme example of not “fitting in” but its owner was just awkward enough to fight the bureaucracy, which no longer works to serve the public but sees itself as having manorial rights. Unfortunately, the move towards mayoralties will probably negate this ruling as each local fiefdom begins to create its own Laws to suit the whim of whomsoever has been ceded power. Labour didn’t win that election, so much as the Tories were thrown out of office by a disgusted electorate. Yes, Labour did a lot of good but it also did a lot that was disliked by the voters (mainly via Blunkett) and this showed in the vote share in successive GE’s. It wasn’t just Iraq that allowed the Tories back in. It was a generation who’d forgotten what happened under the Tories. Those people need to be made to look at what they’ve done this time in terms of food banks, homelessness, prisons, police, fire services, post office, banks, NHS and other aspects of Austerity. On a baking hot day in July 2015 Greece’s radical-Left Syriza government won a spectacular mandate to defy the austerity regime of the EU-IMF Troika. Against all expectations, 61pc of the Greek people voted in a referendum to reject the Carthaginian terms of their latest bail-out deal, a scorched-earth ‘Memorandum’ described by a young French economy minister named Emmanuel Macron as a “modern day version of the Versailles Treaty”. It seemed as if the long-running showdown between Athens and the EU authorities had reached an explosive juncture. Markets were braced for the ejection of Greece from the euro in short order. Monetary union was on the verge of break-up. Yet the rebel victory instantly and inexplicably metamorphosed into surrender, and with it died the final hopes of the European Left. Premier Alexis Tsipras stunned his own people and the world by announcing that there would be no rupture with the Troika after all, and furthermore that he would join hands with the conservative cadres of Greece’s ancien regime. The extraordinary developments are recounted by Yanis Varoufakis in his deeply unsettling account, ‘Adults In The Room, My Battle With Europe’s Deep Establishment’, published in extracts in the Telegraph. What the former finance minister reveals is that leaders of the Syriza government were seriously worried about dark forces in the shadows. They were frightened. Vested interests with huge sums at stake – within Greece, and implicitly across the eurozone – were prepared to defend the existing financial order by any means necessary. The prime minister feared a military coup. His warnings to Mr Varoufakis in soul-searching talks that night certainly raise eyebrows, all vividly narrated in a subchapter entitled ‘the overthrowing of a people’. The final days of the referendum were surreal. Unbeknownst to the Greek people, Alexis Tsipras had called the snap-vote expecting to lose. Most of the Syriza leaders did not campaign. What they wanted was an “emergency exit”, calculating that a respectable defeat would give them a way out after boxing themselves into a corner. But humiliated and long-suffering Greeks instead seized on the chance to express their defiance, rising to a “gigantic celebration of freedom from fear” in the final intoxicating rally at Syntagma Square. He then went to join the victory party at the prime minister’s Maximos Mansion, only to discover that the betrayal of the vote was already under way. “As I walked in, Maximos felt as cold as a morgue, as joyful as a cemetery. The ministers and functionaries I encountered looked numb, uncomfortable in my presence, as if they had just suffered a major electoral defeat,” he said. Only he and his wife Danae were wearing jeans, once de rigueur in Syriza circles. “Sitting there, I began noticing things about the people around me that had previously escaped me. The men resembled accountants. The women were dressed as if for a state gala,” he said. They were like the pigs on two legs, drinking with men, glimpsed through the window in George Orwell’s Animal Farm. Mr Varoufakis told the prime minister that it was his duty to honour the referendum, that he should seize on the thundering expression of popular will to escalate Greece’s war of resistance, and to present the ECB and Berlin with a stark choice. It was wasted breath. The decision to accept what he calls “unconditional surrender” had already been taken, and a new finance minister willing to go along with this volte face had already been picked. The EU has been a costly mistake since the launch of the single currency in 1999, without a Federal State to deal with the inevitable inequities between individual states (formerly independent countries) which would arise. EU bureaucrats knew that they did not have the votes for a Federal Union. Nevertheless, they undermined democracies in the region and also their economic prosperity by launching the Euro in an environment which several centuries of previous history showed was bound to fail. Subsequently, unofficially centralised governance within the EU resembles a left-wing mafia rather than a healthy democracy. That is what Prime Minister Theresa May faces, despite her best efforts to sincerely promote an agreement in the mutual interests of both a departing UK and also the EU. Fortunately, she now realises this, as do a sufficient proportion of the UK electorate to give her a significant majority. That may not influence the EU but it will help the UK to first deal with turbulence following a hasty exit from the EU before fulfilling its potential in the global economy. You are currently browsing the Wiganshale's Blog blog archives for May, 2017.